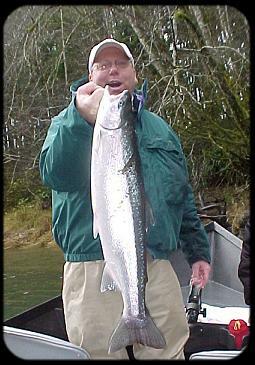 Well, there you are at the start of the winter steelhead season. The fish are starting to come, the rods are all ready, you're ready to go out and chase the early hatchery 'brats'. There's just one problem, you like to toss sandshrimp and the bait man at your local shop is still on his summer schedule ... what do you do?? While we do like to toss eggs for the steelies, we still prefer shrimp tails ... however, getting them on a regular basis can be a problem for some of us during the early part of the run. An old roommate of ours who used to commercially shrimp told me this little trick to help solve this problem. While hardly a substitute for fresh shrimp, this little trick will give you some decent baits to use when fresh sandshrimp are not available. Charlie with an early winter-run caught on sand shrimp. First of all, you need to get in contact with your local bait shop and find out when they are expecting their next shipment of fresh sandshrimp. When they come in, get there fast and get the best cartons of medium-sized females (the one with the little claws) that you can. Next, you need to get some fresh sea water and place the shrimp in another small container like the one-pound butter containers and immerse the shrimp in the saltwater. Then freeze these tubs just as fast as you possibly can, placing them in front of your freezer's blower outlet seems to help. Voila ... you now have a way of preserving these fragile little guys for later use when you can't get them fresh because the bait guy is out hunting elk. These baits do not hold up as well as fresh shrimp, but if you start out with top-quality shrimp and freeze them fast, they do work fairly well. Just make sure that you don't use the foam container that the shrimp comes in, use another type of plastic or glass container.